A fleet of White Line tour buses. Armstrong Consolidated School; Armstrong High School. BC Electric Railway Company's modern service garage for buses opens. Poodle Dog Cafe left foreground; Daillards on the right; Dominion Hotel up the street. BC Hydro buses at Garbally Road, Victoria. Beaton Hotel In Trout Lake. Blue Line Transit bus, Victoria. Boys' outside the YMCA at Blanshard and View Street; on their way to summer camp. 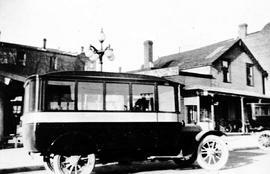 Bus making a stop in Qualicum. Buses Leaving The Vancouver Island Coach Lines Depot, Victoria; St. Andrew's Presbyterian Church In The Background. Buses leaving the garage, Vancouver Island Coach Lines, Victoria; St. Andrew's Presbyterian church in the background. Bussing senior secondary students, Aldergrove.